This idea champions all those little extra enhancements and improvements that make the new Audi A7 extraordinary. 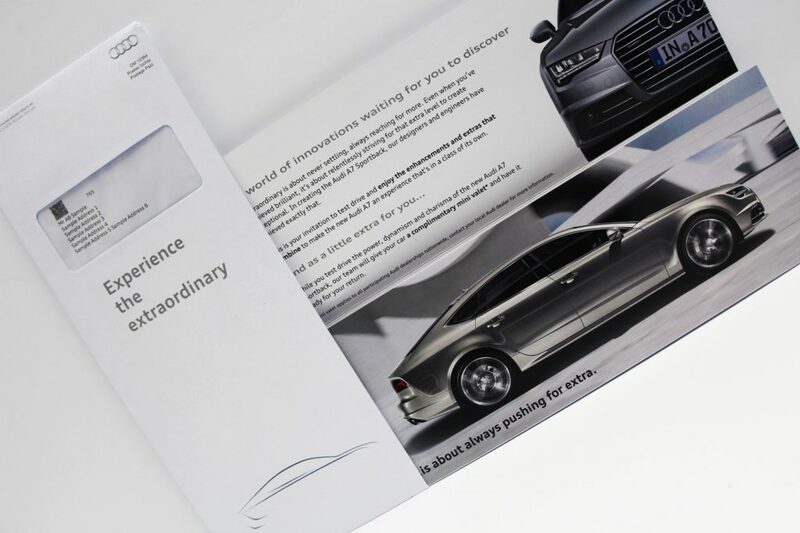 A small on the outer envelope in the style of the Audi outline drawing hints and teases the idea of little things having the greatest impact. Our brochure changes to a long narrow 6 panel landscape format for impact and included a full spread image of the sketch line drawing of the new A7 which folds open to reveal a full length landscape photograph of the new A7 printed with premium UV varnish finish. The mini images featured inside to served to highlight all the little enhancements and extras available on the new A7. Our idea even extended to a little extra customer service too, by offering the recipient a mini valet while they’re out taking their test drive in the new A7!